A large oval fruit native to India and Malaysia that grows on a tree related to the breadfruit tree. It is one of the largest of all fruits grown with some specimens as large as 36 inches in length with a weight close to 100 pounds. Jackfruit is typically classified as being either soft-fleshed or crisp-fleshed (hard-fleshed). The soft-fleshed jackfruit provides a pulp that is sweet and juicy while the crisp-fleshed fruit is less sweet and is not as juicy. 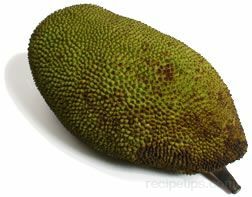 The outer green skin of the jackfruit is covered with evenly spaced protruding spikes that are mildly sharp to the touch. This covering protects a soft inner pulp that ranges from cream to yellow in color with a flavor that is mildly sweet to bland. The firm flesh contains numerous large seeds that can be eaten raw or they can be cooked by roasting or boiling them to be served as a snack. If dried, the seeds are ground into flour. As the fruit matures, the outer skin starts to stretch out and become somewhat soft to the touch. An overripe jackfruit will be noticably aromatic while the inner fruit remains somewhat firm. When cutting into a jackfruit, it is wise to first apply a food oil to any parts of the hand that will come in contact with the fruit, thus avoiding the juice, which is very sticky and gummy. The pulp of unripened jackfruit is prepared as a starchy vegetable. When ripe, it is eaten raw or cooked by boiling or frying and eaten as a fruit. As a fruit it provides a somewhat spicy and sweet tasting flavor. Fresh jackfruit is most often shredded and served in salads or added to desserts such as ice cream. 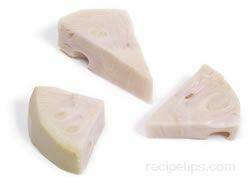 When cooked, it is commonly used as a flavoring and base for curries, syrups, chutneys, or jellies. Cooked jackfruit is also combined with other vegetables to be served as a vegetable dish. Store jackfruit at room temperature for 1 to 2 weeks, or less if it has had time to ripen. Jackfruit can be kept refrigerated for longer periods of time or frozen if covered and immersed in a syrup containing equal amounts of water and sugar.